One of the most perennially asked questions is: what’s more important, the player or the equipment? This is where Yamaha guitars come into mind. This question sets you up for failure, however, as life is not so binary. Both the equipment we use and the skills we bring to the equipment are important for shaping our performance, whether that’s in a sports match or during a music session. In this article, we review 2 of the most popular guitars from the company Yamaha. In each section, we give a brief overview of the guitar, noting its benefits and drawbacks. 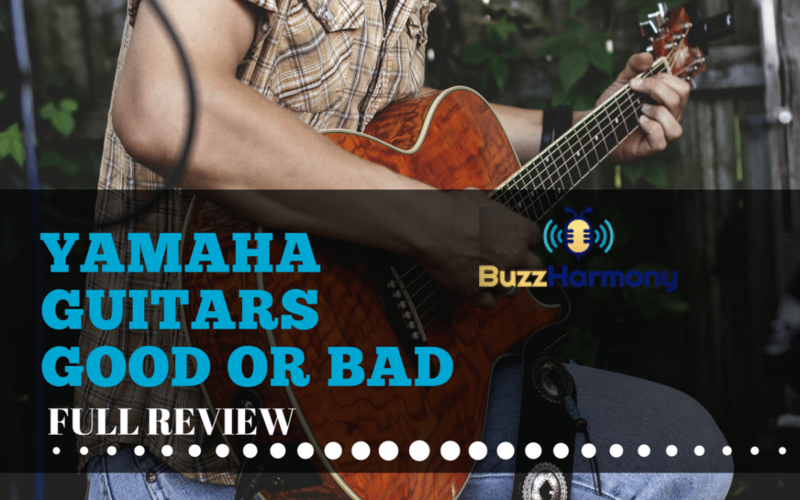 At the end of this article, we offer our final thoughts on whether Yamaha guitars are worthy of purchase. We emphasize throughout how these two Yamaha guitars are representative of Yamaha’s approach to guitar making more generally. The FG800 Yamaha guitar is one of the best-selling guitars of all time, so that should already give you an indication of its quality. This Yamaha guitar can be purchased as a bundle for $249.99 on Amazon. This bundle includes a case, a tuner, strings, a strap, picks, an instructional DVD, and a polishing cloth. The FG800 is an acoustic Yamaha guitar that is perfect for either beginners or professionals. It features a solid spruce top, nato/okoume back and sides, a Rosewood fretboard, and a pickboard made from a tortoiseshell. Additionally, these Yamaha guitars feature scalloped bracing which gives it a more responsive, bass-heavy sound when compared with guitars featuring more straight bracing. The main benefit of the FG800 Yamaha guitar is its affordable price. Not only is $250 dollars cheap for an acoustic guitar of this size and quality, but especially for an expanded bundle that includes essentially every accessory that a beginner might need. Hence, these Yamaha guitars are perfect for beginner players who are on a budget. The first time you invest in a musical instrument, purchasing all the accessories can be daunting not only because of their price but because it’s hard to determine which ones are necessities and which ones are luxuries. This difficulty can make purchasing a musical instrument a dissatisfying experience when it should be precisely the opposite, namely a satisfying, fun experience. With the FG800 Yamaha guitar, customers can rely on the bundle without having to make endless decisions regarding purchasing additional accessories. Customers are able to get everything at once instead of making separate purchases, which can lead to higher costs in the long term. In addition to its affordability, this Yamaha Guitar produces a very a clear sound with good bass. Many advanced players are surprised after using this guitar to learn that it costs as little as it does. They even think this Yamaha guitar could rival guitars that cost over $1000. This being said, this Yamaha guitar questions the idea that price matters when it comes to guitar quality. There are other factors that determine the quality of a guitar that cannot be quantified by price. Guitars are unique products because they age in an interesting way, and this is no different with this Yamaha guitar. Many users have commented that playing a used FG800 produces a rich, incomparable sound. Other users have echoed this sentiment, claiming that Yamaha guitars more generally acquire a certain artistic flair as they age, as the wood and materials they are made of are often natural. Thus, the FG800 is a good representation of the ineffable qualities that a guitar can develop as it is used and modified over time. Many guitars become less effective at translating your sonic intentions and producing clear and distinct sounds over time, but you don’t have to worry about that with the FG800 Yamaha Guitar. Despite these benefits, the FG800 Yamaha guitar is not perfect by any means. Many users have claimed that this Yamaha guitar takes a while to break in. At first, this Yamaha guitar can be difficult to play and can even result in calluses on some player’s hands. While this is pretty common when you first start playing guitars, it still represents a drawback. Some of the most expensive guitars on the market feature technologies that allow the guitar to be comfortably played right out of the store, without a long breaking in period. Of course, these expensive guitars still age gracefully with time. But, the point is that their strings are not uncomfortable to pluck at first, which can be important for beginner players. If your experience is too painful at first, you might be discouraged from developing your skills further. Yet, the FG800 Yamaha guitar lacks some of these more advanced features, which translates to a higher learning curve when trying to master the instrument. Playing the FG800 requires a kind of sacrifice that some users are not prepared for. Furthermore, some critics have commented that the Nato wood used in this Yamaha guitar is not the best. Essentially, higher quality wood exists on the guitar market that will offer greater durability and louder, clearer sounds. The A3M Yamaha guitar can be purchased on Amazon . The A3M Yamaha guitar is available in either a tobacco sunburst or vintage natural color. Additionally, the A3M Yamaha guitar is available in 4 different styles, specifically mahogany, rosewood, solid mahogany, and solid rosewood. These materials play a role in determining the price of the final product, as the use of a solid material in a guitar is more expensive than the material that is not solid. The $799 price reflects the solid mahogany option. Additionally, the A3M Yamaha guitar is available in two sizes, specifically the concert cutaway and dreadnought cutaway. The A3M Yamaha guitar features a scalloped bracing design and is equipped with Elixir strings. The A3M is a more expensive guitar than the FG800 Yamaha guitar that we first discussed. Yet, the A3M is made using more durable wood, which results in a guitar that will likely last longer. Additionally, what’s great about the A3M is the variations that are available. Ultimately, the cheapest variation of the A3M is the basic mahogany style, which costs $499.99 regardless of what size or color you choose. This price makes the A3M great as a mid-level guitar. Yet, for players that want the most durable, expensive wood available within the A3M collection, the solid rosewood style is available. This variation costs $899.99, thus showing the spectrum of costs associated with the A3M. Yet, this range of prices is a good thing, as it presents customers with greater flexibility when purchasing the guitar. Yamaha advertises that they treat the instrument with their A.R.E (Acoustic Resonance Enhancement) process, which allows it to have greater longevity as well as produce a rich, vintage quality tone. This process also helps make this Yamaha guitar sound great the moment you pick it up. While some break-in time might be needed with the FG800 Yamaha Guitar, the A3M Yamaha guitar avoids this through new technologies developed by the Yamaha Research and Development division. Since this Yamaha guitar is so highly lauded for its instant quality, many professionals use it when they are touring or playing shows. The A3M is considered a dependable guitar that will not break down unexpectedly. Many inferior guitars experience all kinds of failures over the years, but the A3M is lauded for minimizing these events. As such, it’s considered one of the most dynamic guitars on the market. There are very few drawbacks associated with the A3M Yamaha guitar. Most customers that use the A3M are extremely satisfied with their purchase. The most common complaint regarding the A3M Yamaha guitar is its price. While this price reflects the quality of certain materials, it also makes these Yamaha guitars somewhat inaccessible for more budget-minded players. Many beginner players like to invest in a sensitive guitar that will help shape their development initiatives. In fact, when players are just beginning to master the guitar, their skills are often a reflection of the equipment they are using, and many of their stylistic quirks develop in response to this equipment. In this sense, it’s vital that beginner players learn their skills on a high-quality guitar. Yet, due to their often-high price, many beginner players simply cannot afford these guitars, especially considering how expensive supporting accessories can be. We think Yamaha makes some of the most reliable, high-quality guitars on the market. Even though we only reviewed two acoustic guitars out of their arsenal, we think these two products are representative of the company as a whole. The FG800 Yamaha Guitar is a simpler, more affordable guitar geared towards beginner players, though more advanced players can play it as well. This is a common theme concerning Yamaha guitars. Many of them are reliable and sensitive enough to appreciate by both beginners and professionals alike. This makes Yamaha guitars very accessible and popular, and they only enhance it by the diversity of products available. Yamaha sells not only acoustic guitars but classical guitars, electric guitars, and even a new type of guitar called a SILENT guitar. Nevertheless, Yamaha has a wide range of knowledge concerning different types of guitars. And this wisdom informs the creation of each specific model. Ultimately, when you purchase a Yamaha guitar, they assure you that you are receiving a piece of technology that has been intentionally designed with optimal acoustics and usability in mind. The A3M Yamaha guitar shows that Yamaha can manufacture a top-of-the-line guitar. With many style options without neglecting their usual signature touch. The A3M features lots of technology and innovations, But it basically feels and plays like a basic Yamaha guitar. This familiarity is a positive thing and grounds the guitar instead of overemphasizing it. If the equipment is overly worshipped, then this could result in a more detached style of play. Where it seeks to avoid instrumental decay rather than to maximize acoustics. This Yamaha guitar is inviting and approachable, perfect for any user. We think Yamaha is a true artist when it comes to designing and creating their products. Their unique touch is on every product, and more sensitive customers will notice this over the years. The best analogy we can think of to explain their products involves animation. While they somewhat geared all animation movies towards kids based on their aesthetics, many of them have more mature themes that older viewers will pick up on. Similarly, all of Yamaha’s guitars are reliable and made using the unique touch of the company. Their more expensive guitars can often be appreciated by more professional aficionados. We think the guitars of the future could be totally different than they are now. We think future guitars will attempt to produce different sounds. As we think eventually humans will experience limits when it comes to making music. Of course, we will naturally look to blame our instruments when our artistry runs dry. This could lead to innovations in how the guitar is designed. Leading to novel sounds and the rebirth of modern music. Furthermore, we think many of the processes used to create modern guitars are unsustainable. As they use considerable wood and animal products in their construction. All this being said, we think future guitars will either use recyclable materials or some new natural resource that is more sustainable. Regardless, we think whatever direction the guitar market goes in, Yamaha will be there every step of the way. This is to innovate and lead. We can’t wait to see what the future holds.